Digital marketing requires marketers to broaden their skill-sets and embrace all digital channels that can reach and engage with their audience. This wider embrace of digital skills has been defined as T-Shaped Marketing, which refers to: a marketer that has knowledge covering a wide range of digital tactics and has in depth knowledge in 1 or maybe 2 specific areas. Two recent example posts have really nailed the importance of T-shaped marketing and both included some great infographics to bring this definition to life. Example 1 – I first came across this phrase from a great post by Mike Tekula of Distilled entitled: Building a T-Shaped Web Marketing Skill Set – Mike went into detail on the growing importance of SEO as a web marketing function and how the breadth of SEO now encompasses so many specific functions to assist in creating a successful strategy and team. Take a browse of the Econsultancy UK Statistics for July 2013 which weighs in at 865 pages (UK edition) and covers the latest trends and market insights for the digital mix such as: digital advertising, affiliate marketing, analytics, blogging, search, content marketing, video, audio, mobile, apps email marketing, search marketing and social media. I have not even entertained the granularity of each of these tactics and the various strategic components each one requires to ensure a successful campaign. As an exmple for SEO – take a look at the graphic above and the various tactics to consider within just this one specialism. 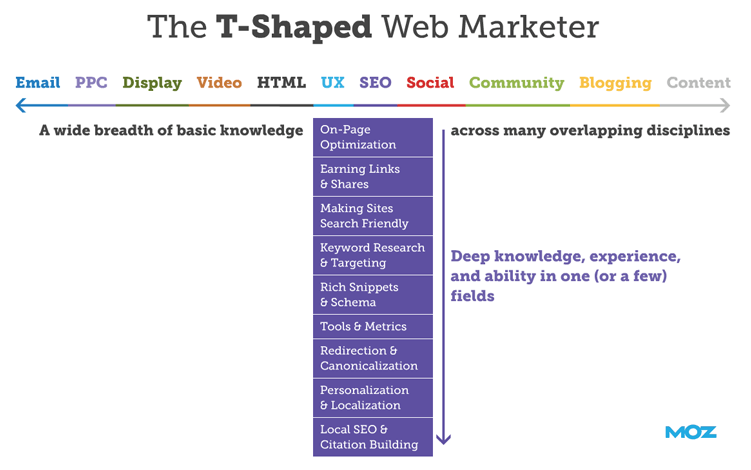 Can you really embrace and adapt to become a T-shaped marketer? By understanding who your audience is, where they interact with your product or service and researching your analytics will provide you with a foundation as to what areas of digital you should look to develop your skills within and identify which of these tactics you plan to focus on an in depth knowledge. In a previous post, I mention the importance of working for start-ups within my own personal journey in developing my digital marketing skills. You’ll find yourself in the front line – getting your hands dirty in managing and developing an affiliate program whilst at the same time, budgeting for a PPC campaign and then helping out your buyers in creating optimised product descriptions for your website and then creating dashboards within Google analytics to monitor and measure performance. 1 – Organisational Integration – As digital marketing matures as an industry, marketers are realising the importance and value in integrating their digital channels together.A recent survey by Econsultancy reported that nearly 90% of respondents describe integration as “necessary and inevitable“. A T-shaped marketer provides the vision and knowledge to an organisation in understanding a number of different digital channels during the integration for the organisation to make the right decisions. 3 – Technical/Marketing – The organisational silos of a technical dept and a marketing depts are becoming increasingly blurred, and rightly so. The importance of technical in how to implement changes to a website/mobile that embraces the need to interact with your customer and assist in a search strategy should be inter-twined within both technical and marketing objectives. Likewise, it’s incorrect to think a digital marketer does not need to understand the technical architecture of a mobile or website or how to create a product feed for their affiliate channel. 4 – Digital knowledge – One of the key attributes of a T-Shaped marketer is the breadth of knowledge acquired across digital tactics – it provides and brings to the table an element of creativity within your organisation e.g. Bringing search marketing knowledge to your team of developers or analytics insights to share this key industry insights to your colleagues. 5 – Think and act like a start- up – You need to put yourself in the mindset that it’s a never ending journey of learning, testing and trialling new tactics. There is a requirement to keep yourself up to date with the latest digital trends and tactics that can be used within the context of your organisation or industry sector. Remember there is nothing wrong in being a jack of all trades as this brilliant article explains, especially in the digital world.